Published in "Natural and Technical Sciences"
In Russian. Translation by the author. 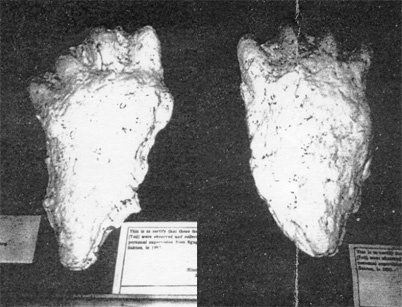 Investigation and classification of Himalayan hominoid footprints is continued. Two new types of footprints are discussed. In previous articles [1,2] two types of hominoid tracks obviously left on the ground and snow in Himalayas by two different species of unknown primates were described. The first of them, based on E.Shipton’s and P.Borde’s snapshots, corresponds to large foot (28-35 cm long and 12-16 cm wide) of a rather heavy primate. It has a distinguishing feature ¾ only four toes, among them two on internal side of the foot are large and well developed, and the other two on external side are small and reduced. The second of these types is based on photo by E.Cronin, descriptions of prints made by some Himalayan expeditions (Daniel Taylor-Ide 1983 and others), and on a print stored at an exhibition post in office of the Bhutan Department of forests, Thimphu . These are left by rather small hominoids (feet have 20 - 23 cm length and 10 - 12 cm width). Primates of this species have five toes, one of which, the thumb, is on the internal side of foot and can move from it aside. The other four toes, relatively small, placed widely on a forward part of foot. These two types do not include all variety of tracks left on slopes of the Himalayas by unknown bipedal animals. The problem in their identification is that they are unique and we have only one photo for each type. The first of newly discussed types is presented by two casts of hominoid tracks in above mentioned office in Bhutan that remarkably differs from the previous two types. They were photographed by George Schaller and sent to Dmitri Bayanov . Their size (20 - 25 cm long) corresponds to a hominoid which is as high as common human or somewhat lower. They have four toes and the big (thumb ¾ the nearest to an axis of movement, or it may be next toe if moving real thumb is extinct completely) is only slightly larger than the others. They are placed widely, similarly to what we saw on E.Cronin's track, but there are no signs of presence of fifth toe on the foot. One may try to connect these tracks with young exemplars of heavy Shipton’s four-toed hominoid type. Obviously, the answer is “no”, because they have no any features of large or ready to develop toe pair. All four toes on these feet are short, thaey are developed approximately to the same extent. These tracks have a unique feature ¾ sharply pointed and narrow heel. Such picture can be received if the calcaneal bone is very thin and protruded back with flat sole as a whole. Among anthropoids chimpanzee has rather pointed heel, but all other features of five-toed foot of chimpanzee have nothing common with the Bhutan cast. I found no similar tracks among results of other Himalayan expeditions. These tracks represent definitely new type of footprints and, apparently, testify about the third unknown hominoid spices in the Himalayas (after Shipton’s giant and Cronin’s creature of moderate sizes). The tracks that differ from all previous had been found out by Tom Slick’s Himalaya expedition during spring of 1957 . 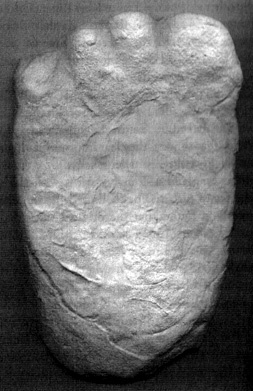 Fig.2 The cast of a track found by expedition of Tom Slick. The footprint had been found out by the expedition in upper parts of river Arun below snow level on damp ground. Therefore its proportions cannot be deformed due to deep snow, snow melting, and s.o. Besides, the damp ground gave an opportunity to get a high quality cast as it is seen on the Fig.2. The track had sizes 10 inches (25,4 cm) long and 7 inches (17,8 cm) wide. In note to the photo it was said that originally five toes were visible on the foot print, but in making the cast of the track two of them became unclear. Considering Fig.2 it is difficult to believe in it. Visible prints of four toes in the cast take all place in front line of the foot. The thumb is precisely outlined and it is not dual, and the other three toes have almost the equal thickness, i.e. there is no place among them for an applicant toe for the dual print. There are no any features that would show an opportunity for the fifth toe on the inner part of the foot like in Cronin’s type foot. Thus, the foot of the hominoid should be recognized as four-toed according to what is seen. The size of the footprint shows proportion of length of the foot to its width is 10/7 = 1,43. The animal with such proportion has the greatest relative width of the foot in collection of Himalayan tracks. Besides this track, Tom Slick’s expedition found other tracks in the same area of the Himalayas. They had size up to 13 inches (33 cm) long that arise the opinion to relate them with Shipton’s tracks. Unfortunately, Slick gave photos of those tracks to various museums and journal editors, and they were lost. Nevertheless, this information may help to consider that the track on Fig.2 is left by the young exemplar of Shipton’s type hominoid. It needs a hypothesis that full development of two large foes of heavy hominoids occurs when they became adult. Otherwise it points on the forth unknown primate spices in Himalayas. Analysis and classification of bipedal tracks met in the Himalayas showed that, at least, three various types of unknown primates live in this area of Asia. 2. Trachtengerts M. On a foot type of a Himalayan hominoid, "Natural and Technical Sciences" 2004, Iss.2, p.143-145, in Russian.